To achieve the goal of transforming User Experience into a strategic function, a company needs a long-term action plan. In my series “Applied UX Strategy,” I’ve written about a model that describes three levels of UX maturity and key areas of effort that can transform designers from implementers into strategic partners. To achieve the goal of transforming User Experience into a strategic function, a company needs a long-term action plan. In the beginning of this journey, there will likely be a huge list of things that are wrong with the company and its products or services. Seeing an enormous number of painpoints for our customers is frustrating and saddens our product designers. Of course, we want to fix all of them at once, but resources may be scarce. Plus, ineffective processes and narrow-mindedness about design often hinder our solving customers’ woes once and for all. Moreover, the value of every change we make may differ, depending on the company’s stage of UX maturity. The goal of design leaders is to find a way to design better products today and tomorrow—thus, enabling a company to sustain good design. UX strategy strives to improve a company’s products by evolving the organization that creates those products. It’s not enough just to redesign an outdated product. You need to ensure you can sustain good experience outcomes. Document the current UX and organizational debt that are preventing you from creating high-quality products. Define a vision for the future. What do you see as an ideal design vision for your company’s products? How can you make it happen? Identify potential problems that are inherent in your organization’s current practices and the value your design changes would deliver. This will demonstrate the value of User Experience to both your company and its customers. Evaluate the difficulty of making these changes. What does your product design team and your organization need to do to make this better tomorrow happen. Define the key stages of change implementation—top-priority, then mid-term and long-term changes. Start incorporating these changes into your product-development process, tracking your accomplishments and promoting positive change. As these changes progress, some good things will happen. Your work will become easier. You’ll fix process problems and increase your credibility. The overall level of design quality will improve, too—including both better quality now and the possibility of continuing to do solid work in the future. Your design-planning horizon will deepen, and your organization will want to leap forward even further. During early stages of organizational change, there will likely be so many business issues that half of your proposed ideas will target those issues. Ideally, you should start not just with ideas about how to fix design issues, but by tackling business problems. Assess your UX debt and business issues, then propose specific enhancements and solutions to provide the best outcomes. However, during early stages of organizational change, there will likely be so many business issues that half of your proposed ideas will target those issues. It will be necessary to implement your solutions for many of those business issues first. At the beginning, your main goal is just for your UX team to survive and prove its competence. 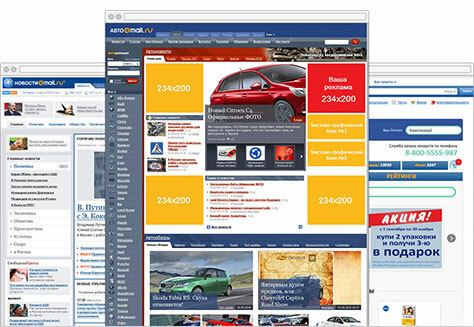 When I joined Mail.Ru Group in the middle of 2011, my colleague Alexey Sergeev had already proven the importance of good design to top management. Thanks to his efforts, in just a couple of years, our business unit had built its first product design team, started doing usability testing, and redesigned several of our key products. 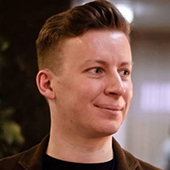 My job was to scale this success with a new team, while Alexey focused on product strategy. However, I realized that, while top management got the importance of good experience design, their understanding had not penetrated the intervening layers of managers. So we needed to build trust for product designers among both middle management and individual contributors. It took me some time to acknowledge this. When I first joined the company, I naively thought we could set up a working process in a month, after which things would run with no hassles. But there was always something new that interfered with our straightforward plans and work processes and prevented task completion. As a result, the first half year was anything but easy. Expectations on both sides—the product design team and leadership—were sometimes far from reality, and I worried that our leaders might soon ask us to leave. I had observed many misfortunes in other companies that were trying to integrate product design into their development process, and the end of the first half year seemed to be a critical point at which everything would either start to work or break up completely. On the other hand, during this time, I was able to understand in detail what was wrong—both within and outside the product design team—so I outlined a plan to combat these corporate painpoints. At first, I thought I would have to defend and prove this plan, but then I realized that everybody was for it, so we should just act. 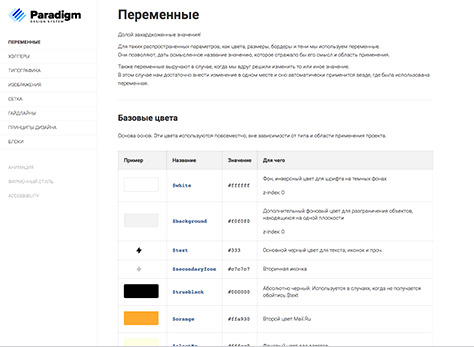 We now have 14 product designers on our design team, which is responsible for about 20 products, including productivity applications, media products, mobile-only products, our portal home page, and our unified design guidelines for the Mail.Ru and My.com brands. While we have more people than we had six years ago, there still aren’t enough to cover all of our company’s products. That’s why we strive to automate our work as much as we can by using a design system, algorithms, and process optimizations. Nevertheless, these limitations have spurred our designers forward, and we have learned to work well using this system, as the figures in the following sections demonstrate. Our mobile apps are app-store leaders, by both customers’ ratings and numbers of downloads. 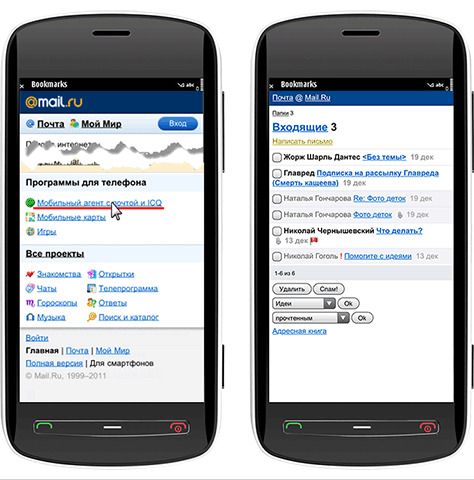 Figure 1 shows our redesigned versions of My.com and Mail.Ru Mail, News, Cloud, Horoscopes, Beepcar, and other mobile apps. Our mobile apps are app-store leaders, by both customers’ ratings and numbers of downloads. 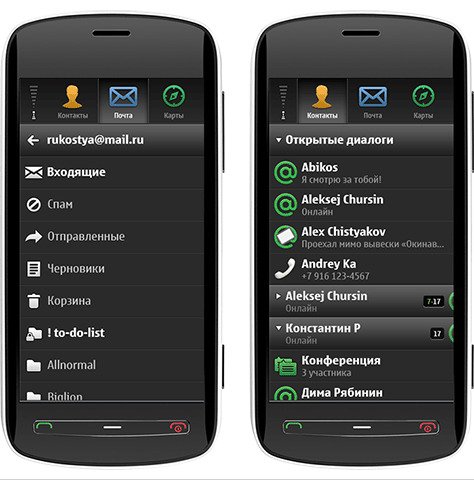 As shown in Figure 2, before the redesign, we had a single mega-app on Symbian, including our messenger, mail, and maps. Figure 3 shows the result of our applying our design system to our media products, unifying twelve products so far—both existing products and new ones that we’ve launched. Before we created our design system, each product team had gone their own way, and there was no unity in their visual style, as shown in Figure 4. Our design system has unified 14 products for the mobile Web, guaranteeing the quality of their user experience and increasing our speed to market. Figure 5 shows some examples of these products. Previously, many of our products for the mobile Web had an ascetic visual style, as shown in Figure 6. 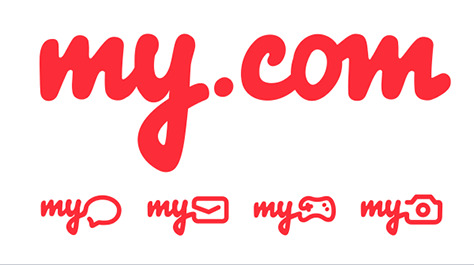 We also created a new brand: My.com, shown in Figure 7. Doing great design is much easier when there is no obsolete branding in wide use across digital products and marketing collateral, and you don’t need to consider older implementations. Of course, there are still problems with some of our products. In some cases, our first redesign didn’t solve all the problems. Still, it’s impossible to diminish the impact of the huge leap we’ve made forward over the last few years. The design system that we created has unified our media and mobile Web products—and, in part, our productivity services. We began work on our design system in 2012. The design system that we created has unified our media and mobile Web products—and, in part, our productivity services. More and more of our products and services are starting to use it. Using our design system save us lots of time as we design and launch new products and features. 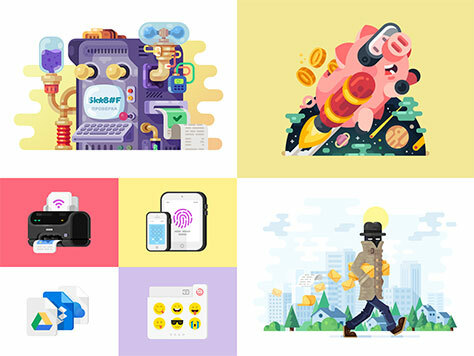 Figures 8–10 illustrate various parts of our design system. Figure 8 shows an excerpt from our color guidelines. 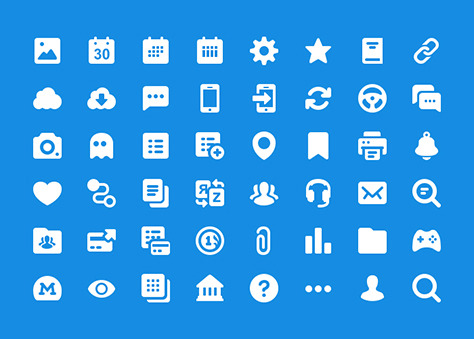 As Figure 9 shows, we’ve created several hundred vector icons in a unified style, and we’re gradually rolling out products that use them. We’ve defined a colorful, modern style for our illustrations that strengthens our brand, naming the style emotional flat 3D. Figure 10 shows some examples of these illustrations. Plus, we’ve unified the designs for our newsletters and landing pages. Figure 11 shows our unified approach for three key types of newsletters—promotional, transactional, and digests. 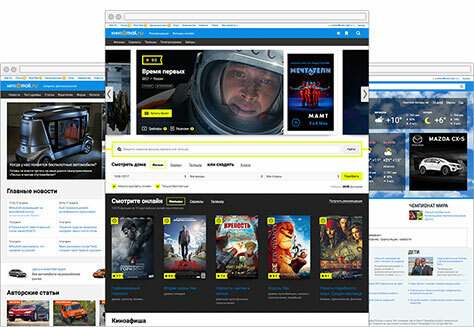 Figure 12 shows our new, colorful landing pages, which still lack some dynamics. In addition to updating our product designs, we’ve [renewed] our organizational structure and development process. We needed to be able to produce good designs consistently and crank them out quickly…. Yes, there are still some products that my business unit and other departments haven’t fixed yet. But we will. Although it would be fantastic to part with the past completely with one redesign, that’s not usually possible and could be risky. There have been many case studies showing that a too steep redesign effort ruined a product and alienated users. So we’ve adopted the practice of continuous improvement—progressing from what was perhaps a nightmare design to good enough, then to modern and trendy, and finally, from following established trends to igniting our own. More importantly, in addition to updating our product designs, we’ve done a lot of work that’s invisible from the outside—renewing our organizational structure and development process. We needed to be able to produce good designs consistently and crank them out quickly rather than doing a redesign once every couple of years. Initially, changing product design often requires a revolution, but after that, it’s best to take an evolutionary path. 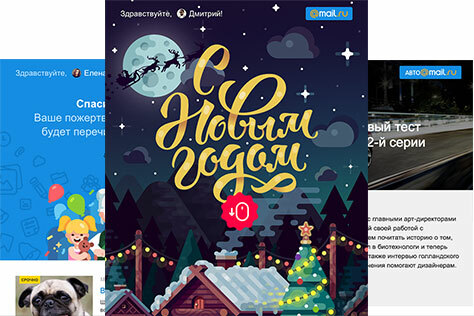 Mail.Ru Group’s experience of rebuilding our products and processes became the foundation for this applied UX strategy series. I’ve compiled a checklist of organizational enhancements, or design-management patterns, that I hope will help you begin making changes within your own company…. 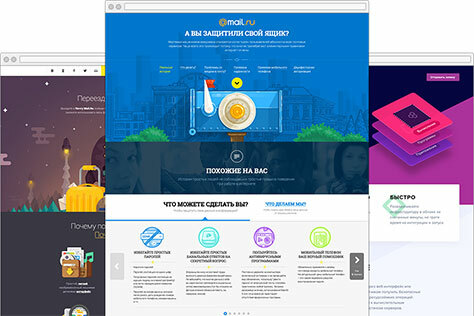 At Mail.Ru Group, we changed our definition of the Product Designer role’s broad responsibilities, so Part 2 of this series focused on that role. When we began, publications about UX strategy and digital product–design management were rare. Now, it’s a different story. Many companies have made similar changes, and their stories have helped other teams to redesign their companies more successfully. Based on our journey at Mail.Ru Group, as well as my observations of changes in other companies, I’ve compiled a checklist of organizational enhancements, or design-management patterns, that I hope will help you begin making changes within your own company—or, if your journey is already underway, to accelerate those changes. As your organization adopts these patterns, you’ll achieve the UX maturity levels shown in Figure 13. In subsequent sections, I’ll use these letter designations to indicate the maturity level of specific practices. These design-management patterns comprehend everything from solving business problems to specific recipes for design managers…. Initially, you must demonstrate to a business that product design can deliver value. Managers trust product designers. They bring designers problems to solve, not solutions. Individual contributors in various disciplines trust product designers. They often contact designers directly for solutions to problems or ask them questions, bypassing managers altogether. Managers bring problems to product designers early, when there is enough time to work on a design. For each design task, there are fewer unnecessary iterations. Product teams have created weak or harmful design solutions. Various product screens look and function differently. Designers don’t influence product decisions. Teams call in designers at the last minute and ask them to put a lipstick on a pig. Managers, product managers, or engineers make design decisions. Improving product quality through design drives business value. When you improve the quality of shipped products, users receive greater value and development costs decrease. Shipped products are high quality, not just the mockups. The growth of key product metrics reflects users’ better opinion of a product. Fewer resources are necessary to sustain a decent level of quality. The visual design is inconsistent or incoherent. It is unclear how features work, so users can’t use them. Products that the company has just acquired or launched are worse than older products. Design implementations ship before designers have had a chance to review them. Designers provide inconsistent or half-baked mockups, so engineers must solve design problems during implementation—even though they’re not design experts. A more efficient product design and development process accelerates time to market, while sustaining product quality. Shipping new features and products more quickly, without compromising quality, creates greater business value. When a product team has a better understanding of the problems they’re solving, creating project deliverables takes less time. Greater speed does not compromise design quality. Launching new features or products takes too much time and effort. Existing features rarely get updated. Quality suffers with each new launch or update. When the number of iterations for every task is unpredictable, deadlines slip and commitment decreases. Passing responsibility for problems to other product team members. There are not enough designers—or the designers don’t have the necessary skills. An improved product design and development process reduces risk. Increasing your success rate when launching new products or features enables you to create greater business value. Users perceive the value of a new product or feature. Users understand how to use a product and can use it successfully. Users’ acceptance of a product is disappointing, so engagement is lower than expected. Decisions about a product’s future have no sound basis—perhaps because the team is blindly copying competitors or has had a panicky reaction to a deviation in a metric’s expected value. A product manager and product team don’t know whether their ideas worked. An excellent experience design engages users and, thus, increases profit. By increasing the value of your products to current users and acquiring more customers, you can generate more business value. Designers help discover successful product solutions for complex problems. Designers propose new opportunities for product growth that get implemented and launched and have a measurable impact. Users can use a product efficiently. The use of a product is clear across the whole customer journey. An entire product team understands business goals and plans. A product is neither profitable nor brings other value to the company. The user base is stagnant or decreasing. The company employs dark patterns to increase profits. Bad design solutions decrease users’ efficiency. Exceptional experience outcomes strengthen your brand. By improving the loyalty of your current users and acquiring new ones, you can generate more business value. A good product user interface strengthens users’ brand loyalty. Good design increases the value and appeal of the company’s brand. Product user experiences are not closely integrated with the brand. Different products or even different screens of the same product look and function differently. Nobody is responsible for the evolution of a product’s or the company’s brand. Various departments and product teams within the company don’t collaborate. Building your design team by hiring and developing the skills of product designers enables the company to sustainably deliver high-quality design solutions. Hiring and retaining enough strong designers who have the necessary skillsets lets you build business value. The designers a team needs are already on the team or can join the team in a predictably brief period of time. Designers’ skills are in line with the company’s needs—now and in the mid-term future. The company’s design costs are reasonable. UX design problems persist across releases. The company is not able to hire strong designers. There is a high churn rate among designers and their level of motivation is low. To devise and implement an effective UX strategy, you must deeply understand a company’s business. Design-management patterns can help you to describe both UX and organizational debt, as well as your future design vision. Then, evaluate the value of making changes to the business, as well as their implementation complexity. Finally, plan the implementation steps. In Part 1 of this series, I described a portrait of a company that comprises resources, processes, and priorities—three key elements that influence an organization’s current and future states. Design managers should understand the environment in which the design team exists and what aspects of it are critical to a UX strategy’s success. To devise and implement an effective UX strategy, you must deeply understand the company’s business. Because the implementation of a UX strategy is unique to a specific company, even if companies have similar design goals, their execution and design details will differ. money—You need to understand how budgeting works. How many designers can your hire? Is there a budget for UX research or outsourcing design? people—What is the designer-to-developer ratio, which is an indicator of UX maturity? sufficient time—At what point in the product-development process are designers involved? credibility—Who is already sold on the idea of good design—top management, product management, individual contributors such as engineers, testers, or marketers? new product or feature initiation—What is the management structure? What insights do you use—analytics or research? How does the team define requirements? How do you measure success? design and development—What are the team’s structure, process, and management? quality assurance—What testing methods do you use? Do they ensure a decent quality level? distribution—What are the distribution channels and their efficiency and user-acquisition costs? support—What support channels exist? What level of user satisfaction and CES (Customer Effort Score) do they achieve. product type—What is the product’s market—B2B, B2C, business to government or nonprofit? What is the product’s platform—Web application, mobile app, desktop app, voice app, virtual-reality (VR) app, or other? business model—What are the key metrics and their optimization methods? Seeking an appropriate market, defining a product for that market, and a business model to monetize it. Growing the customer base and/or profits. Efficiently managing the product portfolio. Recovering from a crisis—for example, when your product’s customer base, profits, and/or market share are shrinking. A company and its products are always evolving, so its goals and business value change accordingly. 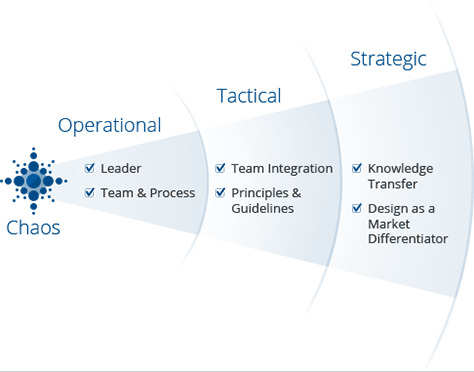 Understanding the company’s goals at its current lifecycle stage, you must prioritize design value for the business, as shown in Table 1. Choose a design-management pattern and evaluate it on a scale from critical, to good enough, to unimportant. Do this on a regular basis. A company and its products are always evolving, so its goals and business value change accordingly. Michael Porter believes that the essence of strategy is choosing what not to do. UX debt manifests as problems with a product’s design, while organizational debt indicates problems in the organization that builds the product. UX debt manifests as problems with a product’s design, while organizational debt indicates problems in the organization that builds the product. Table 2 shows an example listing a company’s organizational debt, while Table 3 shows an example of a company’s UX debt. Checklists and heuristics are useful tools for the purpose of evaluating UX debt. When assessing UX debt, you can use either the brilliant template that Kimberly Dunwoody and Susan Teague Rector created or a ready-made checklist such as Jakob Nielsen’s “Ten Usability Heuristics.” To assess organizational debt, you can refer to the design-management patterns I described earlier. According to my concept of UX strategy, UX debt is itself an organizational pattern. Redesign the change geolocation notification. Remove the sharing block from the left column. Change the news block after an article to a simpler one. Optimize the theater-dates block on the home page. Remove news from the recently viewed list. After going through these checklists, you’ll see what problems the design team needs to solve—to resolve both UX debt and organizational debt. When going through the checklists, you probably identified some blind spots and areas for improvement. … Define a vivid vision for the future of design in the company. These will help you to sell complex changes to top management and product teams. Plus, you’ll discover more ideas for resolving your UX and organizational debt. The list of enhancements you’ll need to make to resolve UX and organizational debt will probably be quite long—especially when the company is at a lower level of UX maturity. You’ll need to set priorities—what you should do first and what you’ll work on in the long term. In some cases, a company may not be ready for a particular method of working; in others, a company may have outgrown a method. The result of this exercise will be a design-team roadmap. This is an implementation plan that sets priorities and shows current and near-term business value. Every pattern includes implementation recommendations: why the company needs it, why it works, and where to start. Ideally, every change should have its own success metrics—so you can understand how the organization and its products have improved. The result of this exercise will be a design-team roadmap. This is an implementation plan that sets priorities and shows current and near-term business value. Alternately tackle low-hanging fruit and long-term initiatives. Solving simple design problems has instantaneous effects, increasing your credibility, which helps you gain some time for working on long-term initiatives. Tie process tasks to product tasks. When making a process change, it’s better to apply it to a real product task. This way, you can find the time to both implement the change and test it in practice. Many organizational changes are multifaceted and require tackling several complex tasks at once to have an impact. Bundle individual tasks into holistic solutions to get a cohesive rather than an incoherent effect. The Objective Key Results (OKR) planning method can help here. 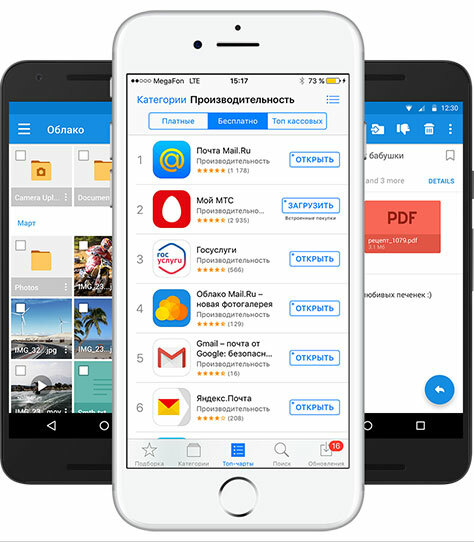 At Mail.Ru Group, we choose three key themes, or complex changes, for each quarter, then describe each of them as a goal, or objective, and define metrics that will tell us whether we’ve succeeded. Then, we plan concrete actions—for our key results—and work through this list during a quarter. This is a good way to focus and mobilize a team, so UX and organizational changes have a significant effect rather than making things only a little bit better. In this example, the goal is to achieve a predictably good level of design quality in a real product. Objective: Launch a quality-control process. Formalize all bugs and design ideas in Jira. In every product release, fix at least one design bug. Take a fresh look by doing peer reviews of mockups daily. Do biweekly design-review sessions with the design team. Do a design review in Jira for mobile apps. Do a design review in Jira for marketing. Include designers in all release mailing lists. Move all design bugs to Jira. Plan design reviews for a product during every subsequent quarter. Negotiate what tasks you need to include in the roadmap to resolve the issues you identified during the design reviews. Create a template to document bugs you discovered during the design-review process. Do a design review after each release. At the end of every quarter, we go back to the first step in this process, bringing our understanding of the company and its design problems up to date. Then, we define the OKRs for the next quarter and start implementing them. Each accomplishment or success of the design team or product team is equivalent to a weekend or a vacation at best—not a golden parachute or retirement. 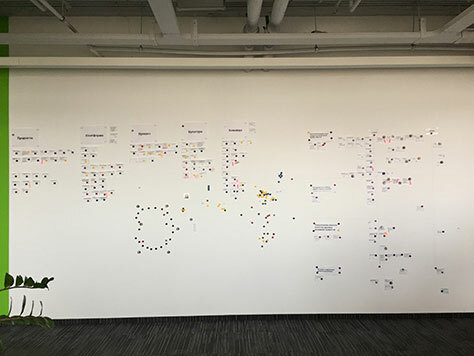 future wall—As shown in Figure 9, this depicts the backlog of UX and organizational debt, as well as the OKRs, in the form of a Kanban board. letters to the team—These tell the product team about current problems and your plans to solve them. Many companies at early stages of UX maturity have many obvious problems, so they could just pick any of them and fix them right away. However, a more meaningful approach involves looking at the bigger picture, which lets you move faster and better understand the long-term UX strategy. Planning is a good way to start working systematically. Even though working through a plan can take a frustratingly long time—as you progress through it, the speed of change increases. You’ll be amazed at how much more strength and motivation you’ll gain in this way. Product designers should initiate changes within the company themselves. Consider changes in design according to their business value. Identify UX and organizational debt. This is the first step toward better design. Make any necessary changes in your process. These are not product-related tasks, but you should still be able to put them into a plan. Be not just a product designer, but also an organization designer—and design the role of a product designer within your organization. Above all, take the long view. Transforming a company into a design-centric organization will take several years. These changes affect not only product user interfaces, but the organization itself—its mindset and culture. Think of your job as rebuilding a socio-technical system, not just redesigning some screens. The most common reason for bad products is that dysfunctional organizations have created them, so your first goal should be to fix your company. In the next installment of this series, Part 6.2, I’ll discuss how companies are transforming product design. Note—Thanks to Kristine Sonne Berg, Sam de Jongh Hepworth, and Katrine Hansted from the UX team at Systematic, who helped me to put together a checklist based on my UX Maturity Model.